Have you had trouble finding a pickup that satisfies all of your needs around Mechanicstown? 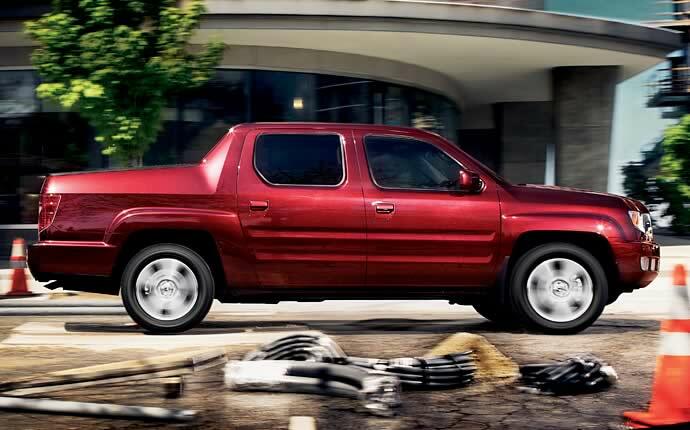 Then visit Middletown Honda and take the 2014 Honda Ridgeline for a spin. This mixture of pickup truck and SUV gives drivers the cabin space they want while also providing the power and hauling capabilities that they need. Sound too good to be true? Let’s take a look at how the Ridgeline compares to another popular pickup truck—the 2014 Chevy Silverado 1500—and see which one comes out ahead. There are lots of ways to save money on your new vehicle, but sometimes picking the right one is all you have to do. The 2014 Ridgeline RT with automatic transmission carries an MSRP of just $29,575, while the basic 2014 Chevrolet Silverado 1500 Work Truck comes in at $33,700 (MSRP). That’s a savings of over $4,000 with the Honda. Those features encompass vehicle control, safety, and convenience, and they aren’t the only ones, either. Honda also gives drivers tow hooks and a trailer hitch as standard equipment—giving you more choices for how to use your pickup—and a CD player with MP3 capabilities. Finally, when it comes to comfort, the Ridgeline features adjustable front bucket seating, which is yet another feature that is unavailable on the entry-level Silverado. We know that there are some drivers that are in love with the Silverado, but once you break down just how much more comes with the Ridgeline—and at a lower MSRP—we understand why we’ve seen more Honda pickups on the road these days. We can talk all day about how the 2014 Honda Ridgeline is one of the best options for drivers seeking a versatile pickup, but at the end of the day, you need to contact a Honda dealer like us and schedule one for a test drive. Middletown Honda is located in Middletown at 520 Route 211 East, and we can’t wait to see you behind the wheel of a brand new Honda. Drop by today.